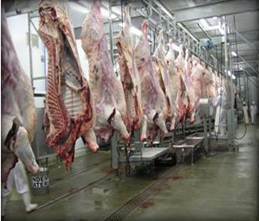 Slaughter technique training provided to member abattoirs according to a monthly programme. Slaughter training is also provided to abattoirs based on requests from provincial veterinary officers, even if the abattoir is not a member. In order for routine slaughter training to take place, the abattoir’s slaughter practices are evaluated and compared with the standard best practice slaughter procedures as regularly updated by the association. Deviations are recorded and corrective training is provided by experienced training teams. 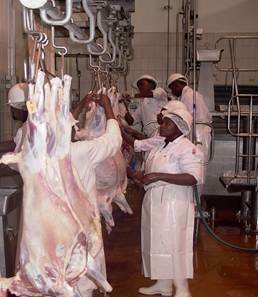 A report is generated and a copy is provided to the abattoir which must be kept as part of the training records as pre-scribed in terms of regulation 55(b)(3) under the Meat Safety Act, 2000 (Act no. 40 of 2000) as part of the Hygiene Management System. After evaluation the findings are discussed with management. Corrections are lastly done according to the layout of the slaughter floor, available personnel and any other factors present. Training is always conducted by first demonstrating the correct and/or best procedure, then evaluating the operator conducting the procedure and conducting a re-demonstration if necessary. Finally competency is recorded for each worker at their respective work stations indicating competency acquired in the new/ adapted technique. A routine slaughter training report is forwarded to the management after completion of the training. Specialised training (inverted slaughtering techniques for sheep and training in the game meat industry) may also be requested from time to time by the industry and training can be provided by the RMAA’s experienced slaughter instructors. A team of experienced slaughter personnel is available to assist abattoirs where a lack of slaughter personnel occurs due to industrial action, personnel turnover or other problems that prevent the existing slaughter team to operate effectively. This is conducted in conjunction with Veterinary Services of the province. This is the first trial slaughter to determine whether all equipment and facilities are stationed correctly and functioning correctly. Any problems are addressed with the abattoir management and Veterinary Services and a complete report is handed to the abattoir.